Ana Sacerdote began studying art in Buenos Aires 72 years ago, at the age of 15. Last week, at the age of 87, she attended the opening of the first solo exhibition ever held of her paintings, at Buenos Aires' Galeria Jorge Mara-La Ruche. Untitled by Ana Sacerdote, oil on canvas, 56 x 87 cm, 1956. Courtesy Ana Sacerdote. Sacerdote was born in Rome, into a middle-class Jewish family. In 1940, growing anti-Semitism prompted her parents to migrate to Argentina, where Anna became Ana. She attended art schools in Buenos Aires for seven years, then continued to study informally with a group of young painters. 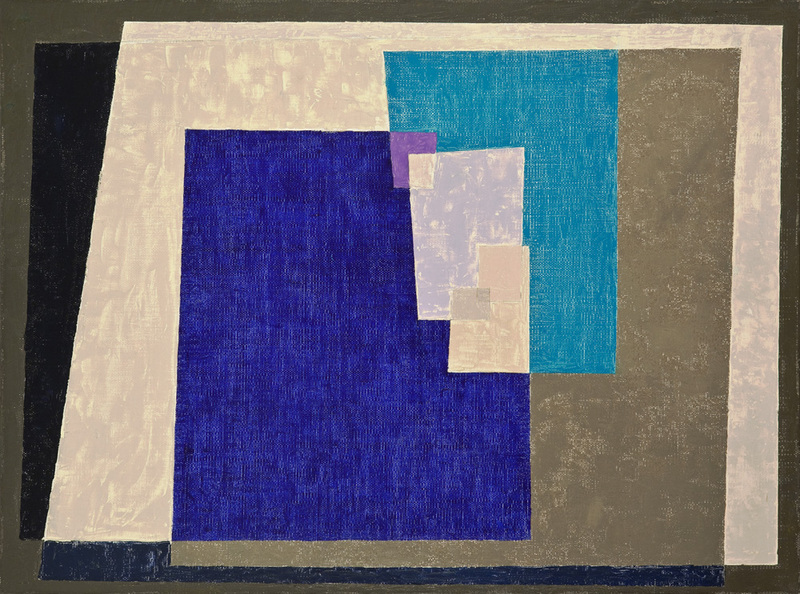 She and her friends were intrigued by the abstract works they saw in French magazines, and she executed her own first abstract painting in 1955. In 1956, she became an editor of Arte Nuevo magazine, together with such prominent Argentine artists as Carmelo Arden Quin and Martin Blaszko. 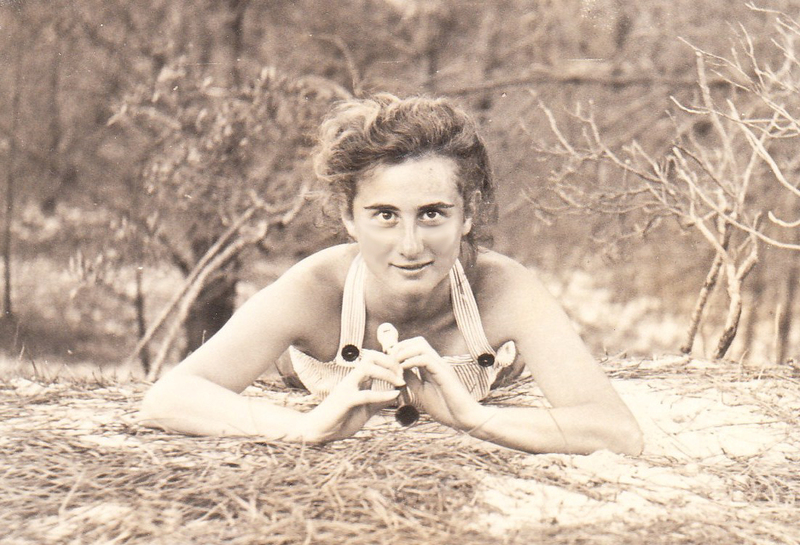 Ana Sacerdote at Piriapolis, Uruguay, mid-1940s. Photo courtesy Ana Sacerdote. In 1956, at the age of 31, Sacerdote won a coveted grant from the French government to study in Paris. There she met Victor Vasarely and a number of other leading abstract artists. She was fascinated by Paris' museums and galleries, and sent back detailed reports of the art world to her colleagues in Buenos Aires. In 1957, Sacerdote married an Argentine businessman. For the next decade, the two lived in a series of different cities, including Havana, before moving back to Buenos Aires. Throughout their many moves, Sacerdote quietly pursued her love of painting. Untitled by Ana Sacerdote, oil on canvas, 59.5 x 79.5 cm, 1968. Courtesy Ana Sacerdote. The current exhibition, Ana Sacerdote: Olios y Gouaches, documents the evolution of Sacerdote's art, from early rigidly geometric compositions to hard-won gestural abstractions. During the 1950s, her work took on a restrained elegance reminiscent of the French tachistes whose work she saw during her stay in Paris. Her mature paintings of the 1960s glow with color harmonies like those of the most beautiful abstractions made in Paris after World War II, particularly those of Nicolas de Staël. It is unfortunate that these were never exhibited when they were first produced, but today they evoke an era very different from the present. Sacerdote's paintings from the 1950s and 60s may be newly discovered, like the contents of a time capsule, but they are poignant reminders of a time when artists could speak of pursuing truth and beauty without irony or embarrassment. To look at them is to remember the pleasures of looking at new art in the 1950s and 1960s. Anyone who loves the abstract art of those decades should make an effort to see her current exhibition. 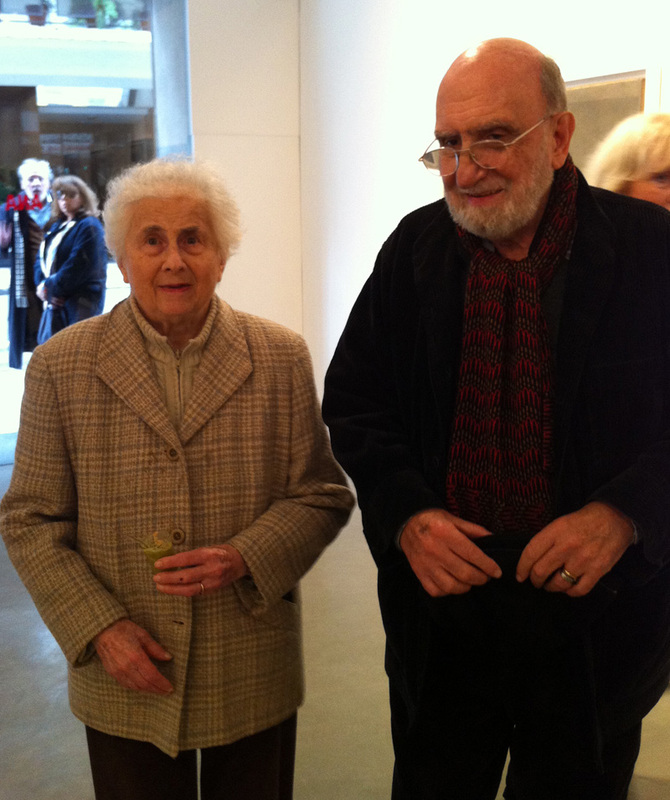 Ana Sacerdote with the Argentine painter Luis Felipe Noé at the opening of her solo show at Galeria Jorge Mara-La Ruche, August 2012. Courtesy David Weseley. Many experimental artists work for long periods without receiving attention from the art world: their art is not shocking or transgressive, but it is dedicated to subtler aesthetic values. And experimental artists are typically diffident, and modest in their claims for their work. Sacerdote's elegant style and modest demeanor strongly fit this pattern. But in her case, these common sources of neglect were reinforced by the sexism of the art world in which Sacerdote came of age, as well as by the fact that her frequent moves prevented her from establishing strong relationships with other artists, dealers, and collectors. Nonetheless, remarkably and admirably, Sacerdote displayed another characteristic typical of important experimental artists, by persevering — working to develop her art in spite of the absence of any significant interest or encouragement from outside her studio. The current exhibition consequently serves as an object lesson, of what an individual can achieve with few resources other than her own talent and dedication. This is an inspiring reminder that producing excellent work can be its own reward. Sacerdote's exhibition would not have occurred without the efforts of David Weseley, an American lawyer and art lover who lives in Buenos Aires. Weseley met Sacerdote four years ago, immediately admired her art, and became determined that she would get a show. Without his efforts, Sacerdote would never have received one. The beauty of this exhibition testifies to what a pity that would have been. The existence of the show is a tribute to the perseverance not only of Ana Sacerdote, but also that of David Weseley. See it if you possibly can. 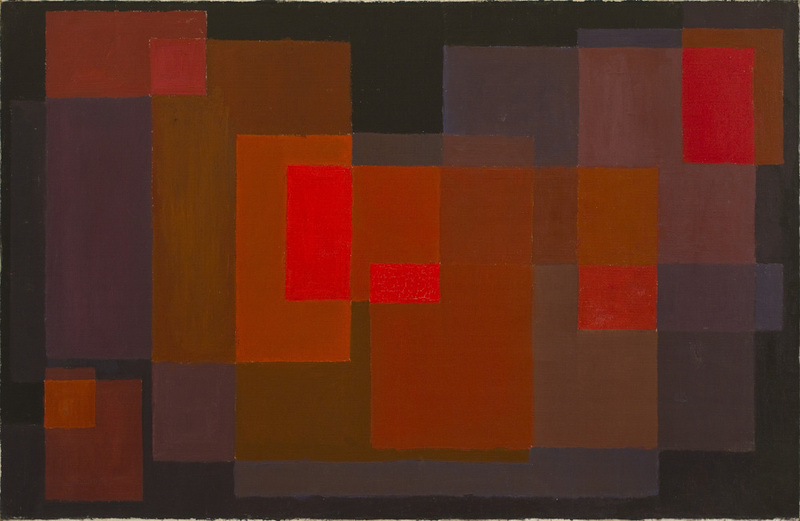 <em>Untitled</em> by Ana Sacerdote, gouache on paper, 10.2 x 16.9 cm, 1954. Courtesy of Ana Sacerdote.